Andrew Henry says: Breakfast at a nearby restaurant Sunday morning. This place has an open kitchen. I took the photo with my phone while sitting at our table. The guy with his back to us is hand rolling raviolis. We thought it was pretty cool. Jeanette says: I like so many things about this place, the red oven hood, the tiled wall, the open shelves, the hanging pans, stacked white plates etc. etc. Also, the food is great. I had white polenta with kale, eggs and fried bread (which I gave to AH). They have these amazing little custard filled donuts with a lemony sauce. Wait............he took a photo of those as well so today you get 2 photos! It was a special treat because we took a break from the auction this weekend - so worth it! 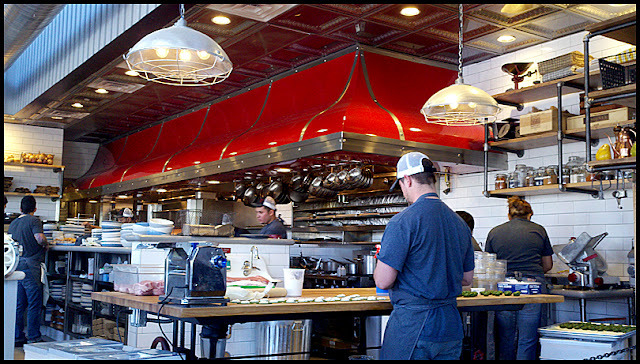 Do you like restaurants with open kitchens? GOSH. I can't wait to move home. I love the restaurants, but mostly the fact that you can be outside right now! Good to take a break from the auction. Love it! What a great atmosphere for eating! I love Andrew Henry's world! I would be a regular at this place! They'd know me by name. I love open kitchens - feels more personal. Fortunately I haven't had breakfast yet so I can go and appease my salivating self with some raisin toast whilst dreaming of those little bits of yummy that you enjoyed. I love them! I think it's such an innovative design look! Oh I love it...no I have never been to a restaurant like that before...I would LOVE it! It looks different is blogger changing again ? 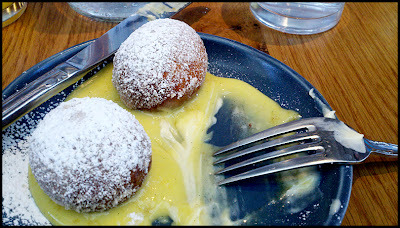 Love the restaurant and the doughnuts look wonderful but what you had sounds even better.